Teacher's Choice of Sandwich or Salad. Please encourage a teacher today. Buy them a lunch credit ( $15 ) and they will know how much you really appreciate them. 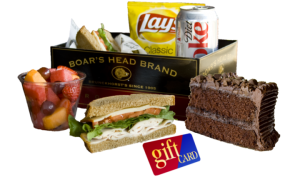 They will get a tasty lunch delivered to their school and we will add $1 to the gift card of their choice. Leave a note on their board and make their day! Example: Thank you for taking the extra time to help Bobby with his math. You are the Best! Please enjoy lunch on us! Your teacher will be notified by email.